GLOW is a nature-themed online video slots machine that transports you to a beautiful Nordic landscape which is bathed in the ethereal glow of nature’s most amazing spectacle, the Northern Lights . The game is impeccably designed and features soothing music and gorgeous scenery to keep you inspired while you spin your way to victory! GLOW offers you up to 15 active paylines on which to stake your free casino credit or real money and uses 5 reels arranged in 3 rows which feature a variety of animals that you can find in the Scandinavian wilderness, including bears, moose, wolves, owls, foxes and hares. 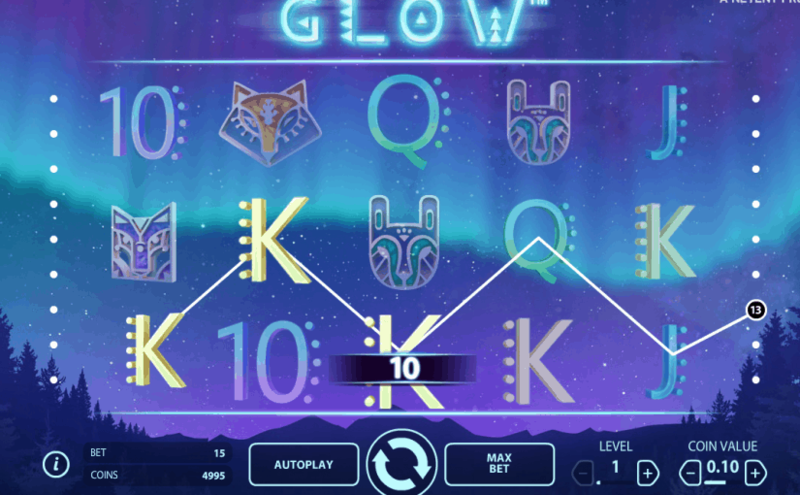 Glow offers players with a wide variety of special features and many chances to multiply their winnings and boost their bankrolls with every spin. Some of the special features GLOW include Wild substitutions, scatter symbols that earn you free spins, reloads or trigger bonus events in the game, as well as multipliers that increase your winnings several times. If you can’t wait to see the cash rolling in, just hit the Auto Play button on GLOW and let the game do all the work while you sit back and have yourself a good time!